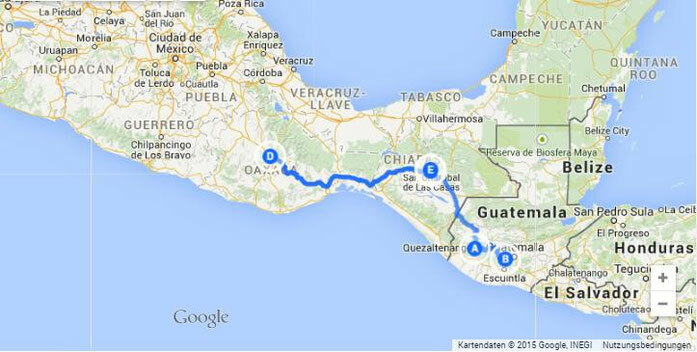 26 March to 30 March 2015: From Antigua in Guatemala I took a shuttle bus to San Cristobal de las Casas in Mexico where I caught up with a friend of mine: the French girl I have met in Oaxaca during my second stay there. I was very curious to come back to Mexico because I left it with almost not speaking Spanish. Finally I could use it! At that time I already booked a flight back to Spain in May. . I wanted to see Oaxaca for third time before I would fly. 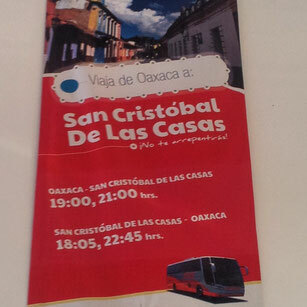 Therefore I was looking for a workaway place in San Cristobal due to it is in the middle between Oaxaca and Cancun. I stopped for about 4 days in San Cristobal (San Cris), met my friend and had a funny evening with some Mayan warriors before I visited Oaxaca and started my workaway job in San Cris. 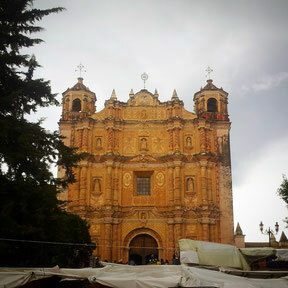 From Antigua (B) to San Cristóbal de las Casas (E) in Mexico. My first impression of San Cris was that there were lots of French people. Therefore I could find lots of really great bakeries and ate bread almost like in Germany. Well, that is really something what I miss during my journey… The good old German bread… My favorite bakery became “La Madre Tierra”. I will write more about it later. It deserves it :-). My second impression was that in San Cris are lots of organic stores and modern hippies (or hipsters). That leaded me to my conclusion that San Cris is a beautiful and creative place for many people who look for this kind of secure world where they can be creative and do almost what they want to do. I felt it was artificial, superficial and in my opinion there was lots of ignorance. For me it did not feel right there. On one hand the expensive organic stores and hipster culture and on the other the poor people who sold their stuff beside the hippies in the street. Well, it sounds probably very judging… Of course not everyone was like that but I met some examples when I came back. Anyway, I can understand the people who will find there a place for themselves where they can be creative. But it was not my place to be. Before I left Guatemala I remembered that my friend I met in Oaxaca went back there. I wrote to her and she was really there. So we caught up and a second friend of us was also there. We all met in the hostal Azul Cielo in Oaxaca. Well, the world is a village :-). It was great to see some familiar faces with lovely souls. I was walking through the streets of San Cris and looked around when suddenly a dark looking guy with a hood over his head talked to me in Spanish:”Qué buscas?” I was first a bit skeptical but told him that I would look for something I could do because I was new here. He said he would invite me to the theater. “En serio?” “Si! Vamos!”. It turned out he worked as actor at the local theater in San Cris. Therefore he did not have to pay for the entrance and could someone take with him. He was quite tall for a Mexican. He told me that his brothers would also be actors and pointed to them on the stage. They are four brothers and all worked there. That was quite impressive. When a woman came on the stage I asked with a wink “pero ella no es tú madre, vale?”. No, she was not ;-). After the theater we waited for his brothers. Two of them came. One wore still the Mayan makeup on his face. By the way: all three had very beautiful and long hair and resembled each other quite a lot. But the one I met was the tallest one. The Mayan warriors took me into a bar where they obviously knew the bartender and ordered Mescal shots for us. I had a look to the Mayan brother right beside me. The one who had still the Mayan makeup on his face. He looked quite handsome... For some reason I could not stop looking at him again and again. I think he knew it. He was very beautiful and his makeup made him even more interesting. And he smelled very good… He seemed to be a bit shyer than his very straight forward brother who talked to me in the street. The third brother did not talk much but seemed to have fun listening to the music and be a bit for himself. We had a second Mescal… Well, that one hit me very strong… We went to another bar where we met the nice girlfriend of the one who talked to me in the street. I seated myself beside the handsome painted one who seemed to be a bit more talkative now. We started to talk about music. That was his topic due to he was also a musician. 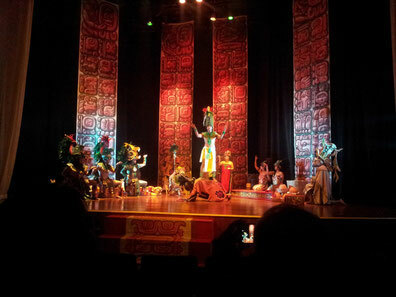 Anyway, the handsome Mayan warrior was now the opposite of shy and we started dancing. Suddenly he kissed me very passionate. It felt good, apart from that I was already quite drunk. I had a very funny and passionate evening and woke up with a bad hangover... I had no phone number or anything from the handsome Mayan warrior. “It was a great evening and should maybe be just one evening. Probably we won’t see each other that fast again”, was what I thought at that time. How wrong I was… And that was good as well. Read next time about my third stay in Oaxaca. I felt once again amazing there! Due to it was Semana Santa all hostals were booked out. Therefore I spent just two nights in my favorite one: Azul Cielo. Unfortunately all my friends were already at different places but I met other nice people. For example one very special German guy who was friends with my friends! When I left in February he came. He is really a nice guy.